Our website folks made some improvements on our system. This is our first newsletter with it. So, please, bear with me. I'm still figuring out how it works. First, it's finally warm out! Some days, it's not raining, either. Hooray! If you are getting hot, just think about those 14 days that were 25 below. In June, all purple fabrics, Hobbs batting & patterns are 25% Off. 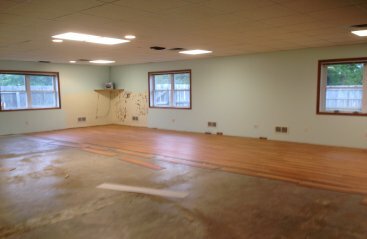 We will also be moving to our new location towards the end of June. No worries, we'll keep you updated on the move. Mom has given me a deadline of June 20th to get the renovations done. 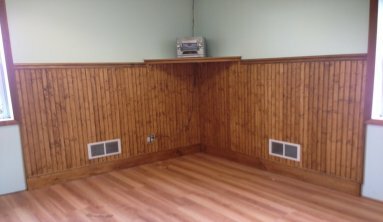 Speaking of renovations..Here's a few photos to show you my progress. 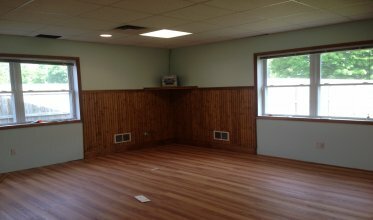 The main room walls are painted, little sinks removed from the 3 rooms, 1/2 the floor is installed, & the Showcase Corner is done. I picked up the rest of the flooring & I'll start installing it on Saturday. Tomorrow, I'm starting to paint the next room while waiting for the flooring to acclimate itself to the Shop's environment. As you can see, we have a lot more light & room. This is just one room, folks! Soon, you'll be able to throw away your miner's hats to see our fabrics. We have maps here at the Shop to the new Shop on Center St. if you would like one, stop in. We'll be happy to give you one. We have an intern with us at the Shop for the next 6 weeks. Her name is Louella. Stop in and meet her! She is studying textiles at college. Sorry, no photo of her yet. I've been too busy working on the new Shop. We will be part of the Row by Row Experience this year. It's nationwide this year. You can plan your vacations around it. The theme this year is the 4 Seasons. We have chosen Summer for our row. I will get some photos of our row out to you next week. The Row by Row Experience will be July 1st through September 2, 2014. Here is the link to Row by Row Experience website for you to check out! Enjoy your Summer, quilters! As always, we look forward to seeing you at the Shop.